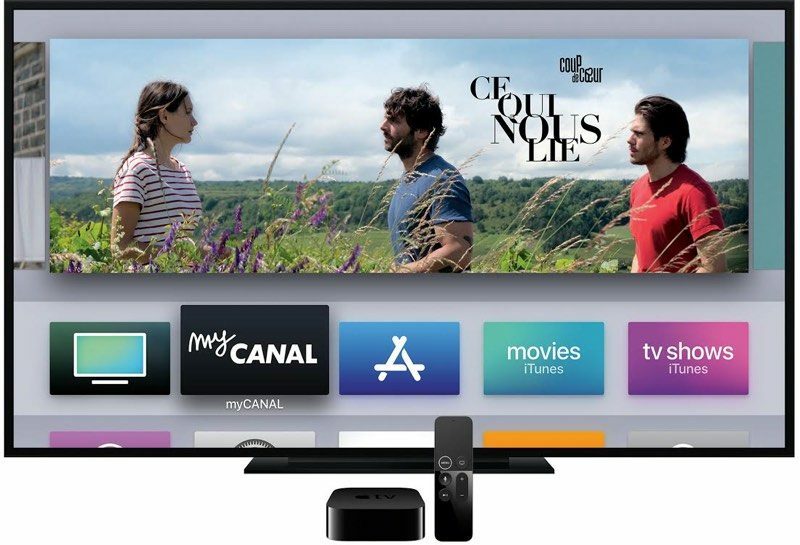 Apple has partnered up with French cable television Canal+ to allow 5.2 million Canal+ subscribers in France to opt to receive an Apple TV 4K in lieu of a traditional cable box. Customers who choose the 4K Apple TV will need to pay Canal+ an equipment rental free of 6 euros, equivalent to approximately 7 dollars. This is the same price that Canal+ charges to rent a standard cable box. In a statement to French site Numerama (via VentureBeat), Canal+ Deputy General Manager Frank Cadoret said that the company's goal with the Apple TV offer is to reach a younger clientele and to offer existing customers a second box. Apple vice president of Apple Music and International Content Oliver Schusser also told the site that Canal customers will be able to "enjoy a rich experience" with access to iTunes movies and the App Store in addition to regular cable programming that will be accessible through a Canal app. Canal+ customers will be able to choose an Apple TV over a cable box starting on May 7. That’s a very smart move on Apple’s part. People will get used to the Apple TV, will purchase apps and movies, and will be more inclined to purchase Apple products so things can will work “seamlessly”. * HDHomeRun boxes from Silicon Dust ('https://www.silicondust.com/'). These are boxes you can plug into your home network and stream either OTA (local) channels and/or cable to any TVs and now Amazon Fire in the home. I picked up both their Prime box (for Comcast cable programming) and their Extends (for OTA local channels & subchannels). Works great. * The $25 Channels App ('https://getchannels.com/'). Most people look right over it because they can't imagine paying $25 for an TV app but it brings ALL of the programming from those HDHomeRun boxes together in an attractive (cable TV-like) UNIFIED, on-screen guide, merging OTA locals with Cable channels. This app allows you to put your channels in any order, set up a FAV channel list, hide any channels you don't want, etc. * The $8/month Channels App DVR ('https://getchannels.com/dvr/')- a full-featured, traditional hardware-like DVR that brings all of those key features NOT available on virtual DVRs to any TV in the house. Your DVR capacity is then NOT limited to ANY size- just add hard drives- and the recorded programming is accessible on ANY TV or computer or mobile device. This combo brings all of the advantages of traditional cable without cable box leases. Feed as many TVs as you like with :apple:TV as "the box." Relative to streaming service alternatives to traditional cable, all of the tradeoffs of the streamers are overcome by not completely cutting the cord. In short: you don't have to wait for your cable company to make this happen. Look into doing it yourself. Now that I have a 4K TV with Roku I rarely use my Apple TV. And it's almost the opposite for me. Once :apple:TV could become THE cable box, it gets just about daily usage, sometimes for several hours... where it used to sit for upwards of days before getting any use. TVs don't have enough HDMI ports. That's one reason to buy yourself a great receiver. Then the TV needs as little as just ONE HDMI port. Comcast would NEVER do this (sadly). They could charge a $10 per device access fee too. Ugh. But they’re too busy licensing out X1. So bypass Comcast. I'm using Comcast cable service with my :apple:TV. Post #10 lays it out. Works great. If I were a US Cable Co looking to extend things as long as possible, I'd jump all over trying to get an exclusive with Apple for something like this. They don’t want to give up control. This means that Apple could potentially just allow people to use the Apple TV they purchased if not already which now gets rid of their lucrative forced rental service. Then if Apple luanches their own service people could just drop cable all together. Comcast already lets you use your Samsung or LG smart tv as a “cable box”. The change is coming whether Cable companies like it or not. Simple - the writing is on the wall one way or another.. But I'd happily subscribe to a content provider that's competing with the likes of a Vue or YTTV (of which I currently subscribe). It's just a matter of time for the old model of their junk 1st party equipment and all the complications and extra fees and nonsense. Let me ask you about that. I was thinking of getting Alt TV too but stopped when I realized it only allows you to watch shows in real time. IOW, you can't record them or go back and see any show that you've missed. Do I have that right? That’s partially right. With Alt TV, you can’t record, but you can access the OnDemand library for any channels you are subscribed too. However, not all shows are available on demand (SNL isn’t available for some reason). And some shows make you watch two commercials that you can’t fast forward through. Most of the shows I watch are from the on demand library. However, you can get the basic package for $14.95 a month, which is all I really want. Just basic networks so I can watch the occasional live event. You can pay an extra $10 a month and pick 5 a-la-carte channels. That’s good enough for me. If you move up to full on Fibe TV, you get a PVR that can record shows, and you can watch those recordings on your Apple TV along with live TV in the Fibe TV app. With Fibe TV, it costs more per month because they only offer bigger packages. For the limited amount of TV I watch, it’s the best value for me. If you want more channels it makes more sense to move up to Fibe TV with the PVR. Why? Then people will rent/buy movies from iTunes and not the cable provider. Additionally, they'd also chew into their own profit margins on DVR rentals. Comcast for example charges a $10 DVR fee AND a $10 HD fee to get it on that DVR (yes, even in 2018 SMH). This is basically what DirectTV NOW is, except we own the boxes, so it's a loss of revenue to the TV provider. But they also can send people do it yourself kits and do away with cable installers, etc. [doublepost=1526344343][/doublepost]Kinda surprised the app is called My Canal and not Mon Canal...as much as the French hate English taking over.